As long as there has been a need for language, there has been a need for translation; yet there is remarkably little scholarship available on pre-modern translation and translators. 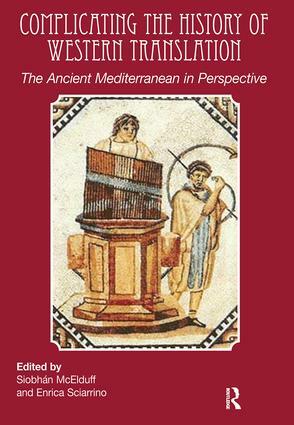 This exciting and innovative volume opens a window onto the complex world of translation in the multilingual and multicultural milieu of the ancient Mediterranean. From the biographies of emperors to Hittites scribes in the second millennium BCE to a Greek speaking Syrian slyly resisting translation under the Roman empire, the papers in this volume – fresh and innovative contributions by new and established scholars from a variety of disciplines including Classics, Near Eastern Studies, Biblical Studies, and Egyptology – show that translation has always been a phenomenon to be reckoned with. Accessible and of interest to scholars of translation studies and of the ancient Mediterranean, the contributions in Complicating the History of Western Translation argue that the ancient Mediterranean was a ‘translational’ society even when, paradoxically, cultures resisted or avoided translation. Indeed, this volume envisions an expansion of the understanding of what translation is, how it works, and how it should be seen as a major cultural force. Chronologically, the papers cover a period that ranges from around the third millennium BCE to the late second century CE; geographically they extend from Egypt to Rome to Britain and beyond. Each paper prompts us to reflect about the problematic nature of translation in the ancient world and challenges monolithic accounts of translation in the West. Cicero’s Translation of Greek Philosophy Personal Mission or Public Service?